After reviewing the rental listings, please contact an Atlantic East rental agent to discuss and book the best home for your needs. The agent will confirm the price and availability with the homeowner and with you. A lease will be prepared and sent by e-mail or mail for signatures. 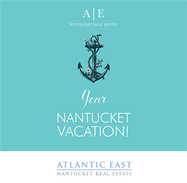 Atlantic East is one of the only offices on-island that does not charge an extra tenant processing fee! Effective January 1, 2019, short-term rentals (defined as those of 31 days or less) are now subject to an 11.7% state room occupancy tax. There is a possibility that there will be an additional 2.75% tax for the Cape and Islands Water Protection Fund before the year is over. We will send you three copies of the lease, a legally binding contract summarizing the terms of the rental. The lease is due back at our office, signed with a deposit of 50% of the total rental amount within seven days. If we do not receive the leases and payment, the homeowner has the right to rent to another tenant. The final payment and security deposit will be due 30 days before your arrival date. We will send you payment reminders. The typical security deposit is 10% of the total rental amount. This amount could be more at certain properties. The deposit is held by the homeowner and will be returned to you within 60 days from your departure date. Deductions from your deposit may include long distance phone charges, cost to repair damage and/or excessive cleaning costs. If it becomes necessary to cancel your rental, it is required that you notify the agent in writing by certified mail. We will do our best to re-rent the property. If we re-rent the time period we will return your money, less a 15% cancellation fee. You are responsible for payment in full as stated in the lease. Did You Dawdle, Dilly-dally or Procrastinate? We continue to book vacation homes right up to a week before you wish to arrive. For last minute rentals, payment will be by a bank/cashiers check or wire transfer. We do not accept credit cards. Pets are generally not allowed. If you need to bring your pet, please request a pet-friendly home. An additional pet deposit will be required. All of our vacation homes are offered furnished with all bed/bath linens and cooking and dining utensils. Saturday is the typical turnover day; we do have a few homes that turnover on Fridays and Sundays. If you have any special needs, please contact the agent.